My essay, “Lessons from Jane Austen,” has been so popular that I decided, in all fairness to historic female English authors, to write an essay on a Brontë! More precisely, I composed this essay primarily on Jane Eyre, the most-famous novel of Charlotte Brontë. It is the only piece of writing that I have read by this tragic authoress; she is the only Brontë sister (of three) whose work I have read. The brief life and harrowing death of this English novelist and poet (21 April 1816 – 31 March 1855) are so disturbing that I shall dispense with details or even a synopsis, save these dire facts: Charlotte died at the age of 38, during the first year of her marriage and whilst pregnant. Her unborn child died with her. The Latin “sighs from the depths” are probably what put this novel over the top, at least in terms of readership. The Brontë sisters evidently knew how to till the soil for publicity that worked! 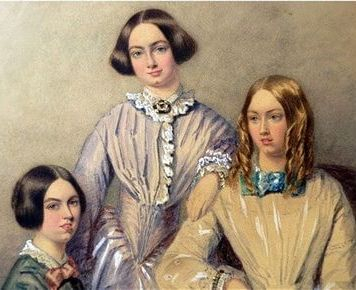 There were, in fact, concurrent publications of sister novels by all three sisters: Jane Eyre by Currer Bell; Wuthering (this word was repeatedly auto-corrected to “withering” by Apple Pages), yes, Wuthering Heights by Ellis Bell (aka Emily Brontë), and Agnes Grey by Acton Bell (Anne Brontë). I think the use of the same surname for all 3 pseudonyms, as well as the use of matching alliteration for the first names (real and fictitious), were obvious tip-offs that ought to have quelled any speculation about the identities of the real authors. Self-promotion worked extremely well for these oppressed Victorian women! 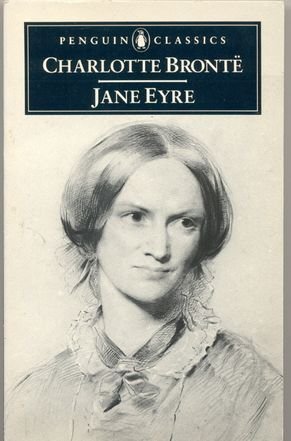 Jane Eyre immediately developed a reputation as an “improper book.” Whether it was intentional or not to create scandal, this scandalous sales scheme worked magnificently. The impropriety, real or not, of this novel is not, however, the primary reason why I did not read this book until nearly a decade ago. I simply had no interest in Gothic schmaltz. It was never on any university reading list (although that limitation never stopped me from reading more than a few books that had been deemed un-literary). There was also the enduring influence of dear Professor Bell, the Jane Austen devotee. He mocked the boring histrionics of all of the Brontës so much that I veered sharply away from all of them. Indeed, milord, indeed. But more on this wretched dullness later! — and the dark and stormy night (and day). On dark and stormy weekdays, eleven of them, about ten years ago, Dear Daughter and I partook of those learning moments that can only be enjoyed when a home-schooling mother and her student-daughter are each of “a certain age.” Dear Daughter had already read this novel, along with Wuthering Heights, and had become quite the expert on British history as well as British royal history and its lineage. We also watched that winter the BBC mini-series, The Six Wives of Henry VII, starring Keith Michell [! ]; and to this day I, the linear thinker, still cannot grasp British royal lineage. I still confuse Bloody Mary with Mary, Queen of Scots. As I typed those words, I had to take a break to fact-check the two Mary’s on duckduckgo.com. Maybe there are too many lines and too many Mary’s for me to follow (or too many ducks to get in a row). 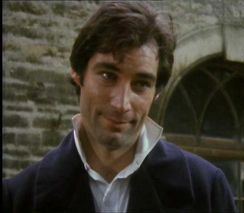 It became very clear to me during the very early episodes of Jane Eyre that Timothy Dalton was not only a man with very potent chemistry but he was a man who totally lacked chemistry of any kind with his demure but expressive leading lady on the screen. I began to yawn, which was not an uncommon experience at 4 p.m. 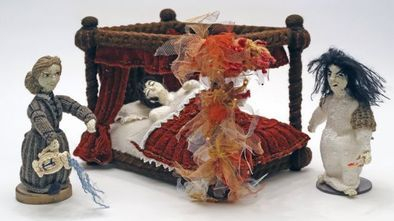 The yawning, however, became notable only when I watched those two performers on-screen. I tried to figure out the ennui with Dear Daughter, who suppressed her yawns. We decided that the lethargy induced in the viewer was due to the disparity in acting ability between actor and actress: Dalton ran thespian circles around Clarke. The only scene in which they became even remotely evenly paired was a rather crucial one in which each was trying to out-do the other in the attempt to suppress a laugh in order to utter their utterly preposterous dialogue. Mr. Dalton had quite the effect of “suspiria de profanes!” (sighs from the depths) on this writer-of-future-novels. Perhaps it was the dark and stormy late afternoon settings, but during the two weeks of my indulgence in watching and listening to this Byronic master with the cleft-in-the-chin and to the meek but cheeky governess with the delicate features, I too easily forgot my role as chief-cook-of-foothills-cabin-estate. This meal, commonly referred to as “the Junk” in my household, consists of easily prepared ingredients that are mostly vegetables, along with warmed tortillas (or, in a pinch, tortilla chips). The only truly cooked component is the refried beans. By week two, the regularly scheduled but always innovative meal plan included the euphemistic “Free Night,” which means that every one gets to choose his, or her, own meal. And each person cooks it too! The reading of Jane Eyre did not deter me from my official afternoon tea duties; I greatly enjoyed Yorkshire gold tea and jam-thumbprint cookies during some of the more profoundly sighing scenes! But to return to the novel, Jane Eyre! From a literary perspective, I found the writing inconsistent. The plot was strong in some stages, weak in others; the pace toward the end was plodding. The dialogue, however, was very dynamic. Some passages of narrative prose were beautifully moving. 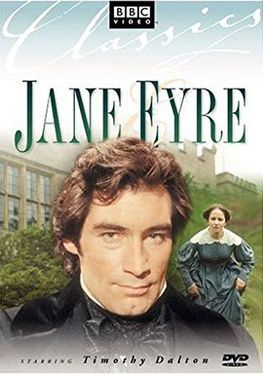 Jane Eyre was a novel - ahead of its time: it was marvelously made for Hollywood. But not for a tv-movie!